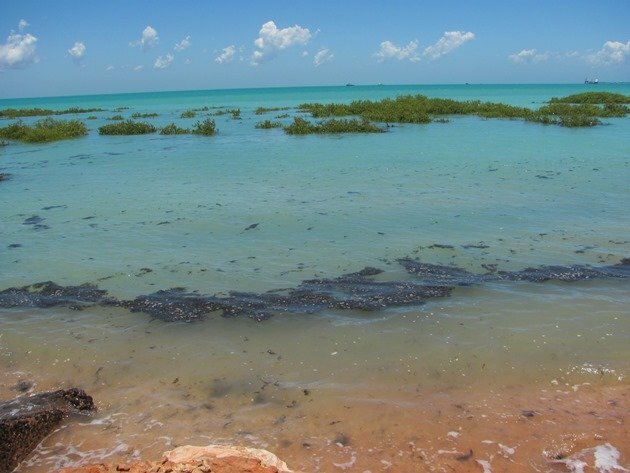 At the moment in Broome there is an outbreak of the cyanobacteria called Lyngbya and it thrives in warm water, so the conditions are ideal at the moment. The Lyngbya is growing across the seabed and smothering the seagrass and then become buoyant and float to the surface. Huge mats of Lyngbya are now floating in and covering the mangroves, beaches and it is advisable to not enter the water due to the toxic nature of the plant. 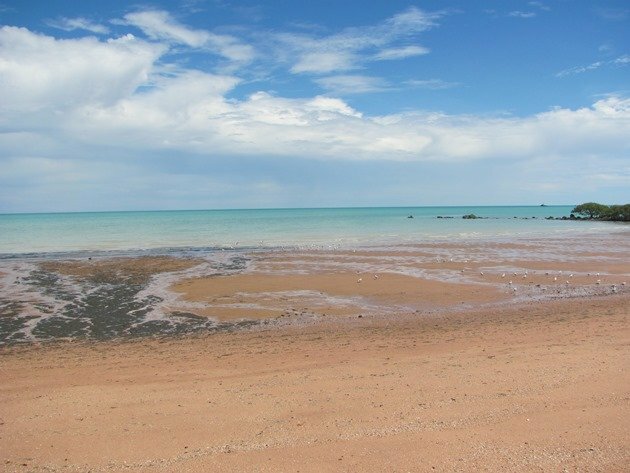 It is not unique to Broome and in fact it is quite a new problem in Broome and has only been occurring in recent years. 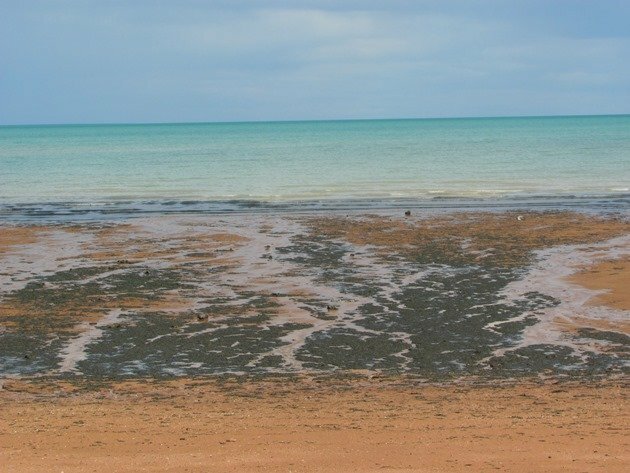 It thrives on extra nutrients in the ocean, so we are advised to be mindful of using fertilizers in our garden that may wash into the ocean during flooding rains. It has been a problem in the Peel area to the south of Perth and also in Moreton Bay in Queensland. 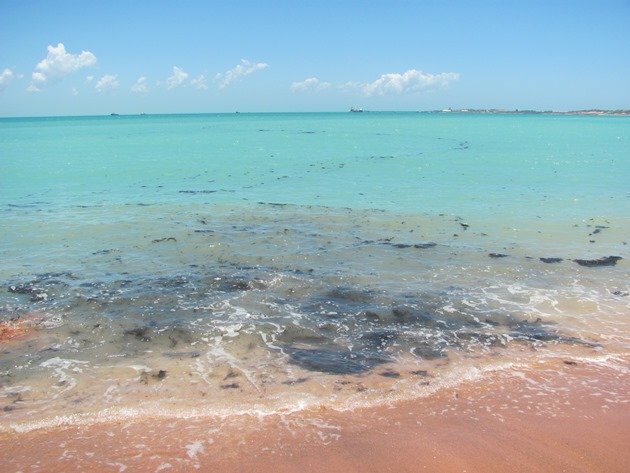 At Town Beach in Broome on high tide you can see huge clumps of it in the sea and it follows the tide line in and affects some areas worse than others. 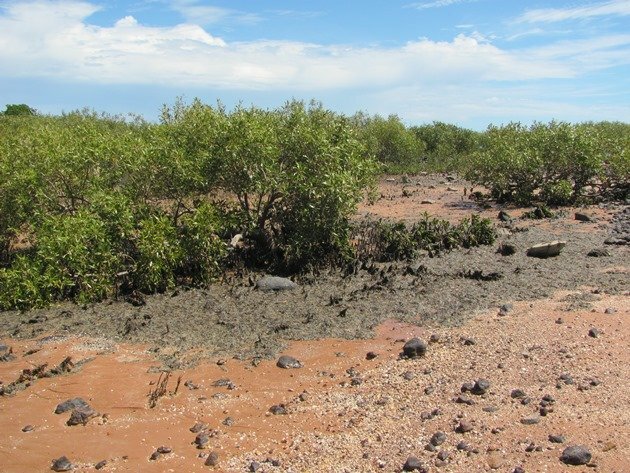 As the tide drops it gets left behind smothering all of the areas around the mangrove trees and on the beach itself. The Silver Gulls are avoiding it and roosting away from it. 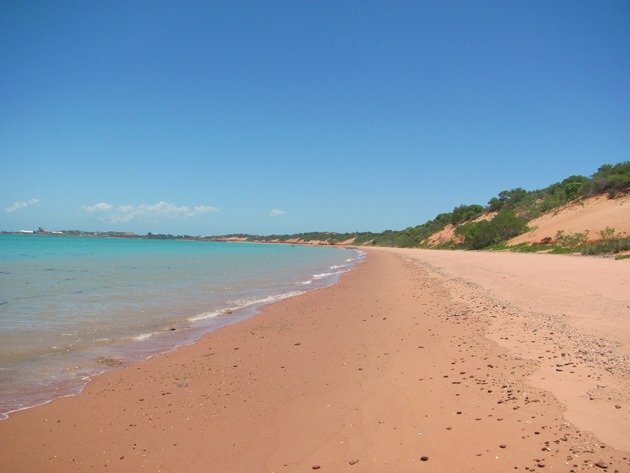 I walked towards the Port of Broome along the beach to get beyond the Lyngbya and finally the beach was clean and further ahead the shorebirds had come to roost. Thousands of shorebirds use this beach at this time of year, but they have adapted the position of their roost to avoid the Lyngbya this year in particular. It is the one area of beach that is mostly clear of the algae and where the shorebirds can walk without it collecting around their feet. 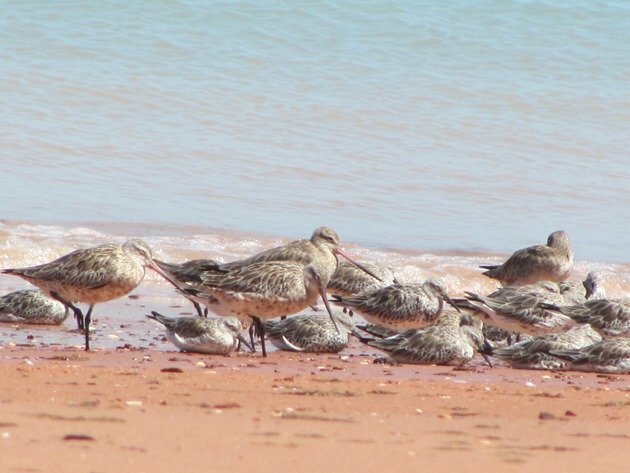 I have still seen shorebirds with large clumps of it around their feet, but it would be unavoidable because they feed once the tide drops back. 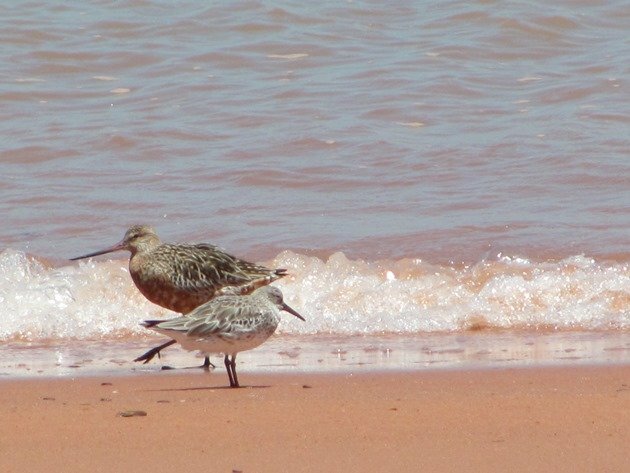 It is unclear at the moment what affect the Lyngbya is having on the food that the shorebirds rely on to enable them to put on enough weight to be ready for migration. I am privileged to have this beach to myself almost every day and there is no doubt that I am accepted by the flock of shorebirds. I can get incredibly close after high tide and we can all sit on the sand together and relax and contemplate the tide falling. I only have a compact camera, but I can often sit almost among the shorebirds and we just enjoy what the beach has to offer. I prefer to visit after high tide, because the shorebirds are always more nervous before high tide when they are constantly being pushed up the beach by the rising tide. One shorebird that I have been seeing quite regularly on this beach over recent months is a Great Knot that was flagged in China on 6th April last year as it headed north. The site uses black over white flags and the unique code on the white flag of” E65″ means that it can be tracked throughout the Flyway if it is observed. It will soon be getting more breeding plumage and heading north once again. 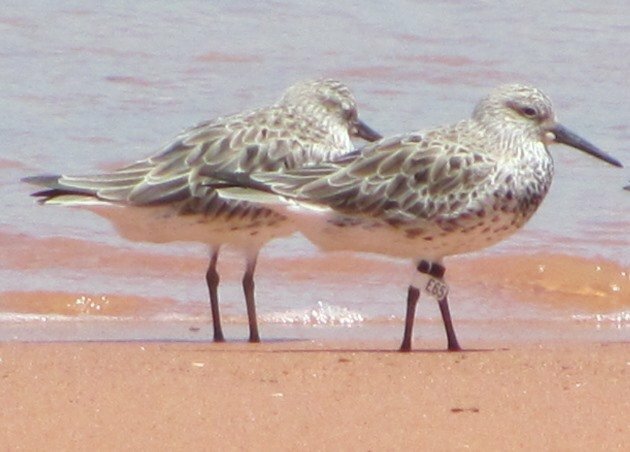 I have noticed that this year with the Lyngbya outbreak being particularly bad that the shorebirds do appear to spend more time scratching, so it is likely that it affects them also. 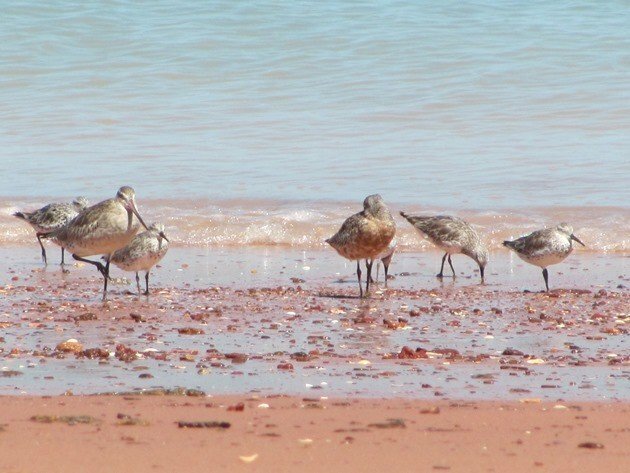 The majority of the flock is Bar-tailed Godwit, Great Knot and Red Knot and they were quite relaxed lying on the wet sand once the tide had fallen. Some started to feed shortly after the tide turned and others chose to relax until there was more mud exposed. Already there are some nicely coloured male Bar-tailed Godwits, with a shorter bill than the female Bar-tailed Godwit. 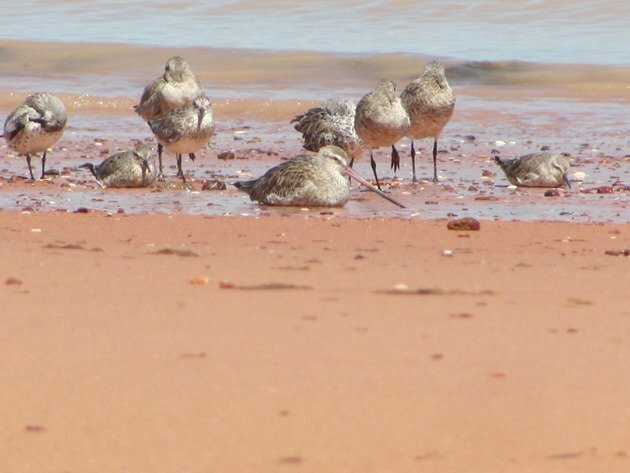 There is a wide variation in the amount of breeding plumage in the other species, but it is already apparent on many of the Great Knot, Red Knot, Curlew Sandpipers, Lesser Sand Plovers and Greater Sand Plovers. 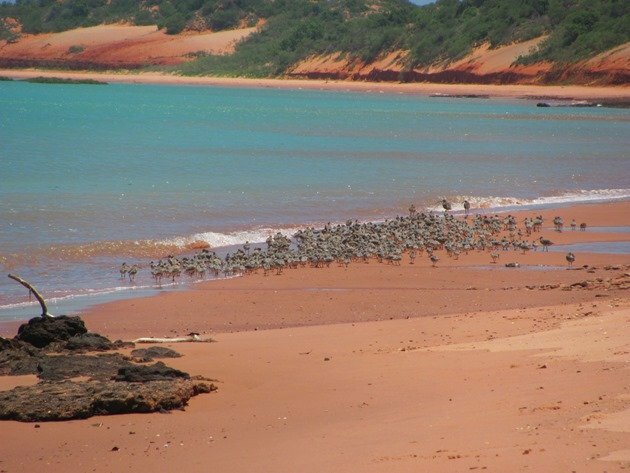 We truly hope that this algal bloom is not affecting the food quality or quantity that these shorebirds rely on in Roebuck Bay before migration. Over the coming weeks they need to fatten up and get ready for a long journey and there are enough other perils along the Flyway without having a poor start from this end. Okay, so it’s venomous snakes, deadly spiders, poisonous trees, murderous jellyfish, morbid octopuses, hungry crocodiles, cold-blooded sharks, disembowling cassowaries, and now cyanobacteria. 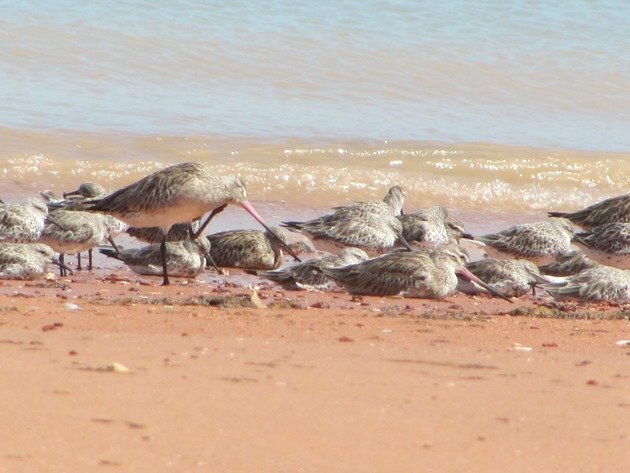 I love the image of you sitting amongst the Great Knots, Godwits, Red Knots, etc. Stupid cyanobacteria. Thanks, Donna. At least it does not smell!